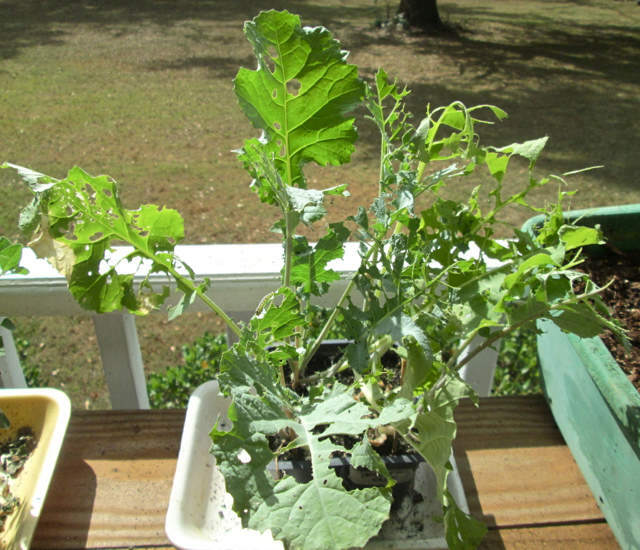 Overnight the four kale plants out on the porch were attacked. These sets were perfect yesterday afternoon when I watered them! They need to get in the ground along with the rest of the brassicas but it's been too hot and dry. Hopefully there's some rain possible for Sunday and Monday. If we get a good soaking Sunday, I will do some planting Monday. But I'll believe it when I see it! Those are Dogwood Sawfly larvae. They can do a lot of damage quickly, as you found out! How do you kill them? I think BT will work well. I just read that sawflies kinfolks go back 250 million years. 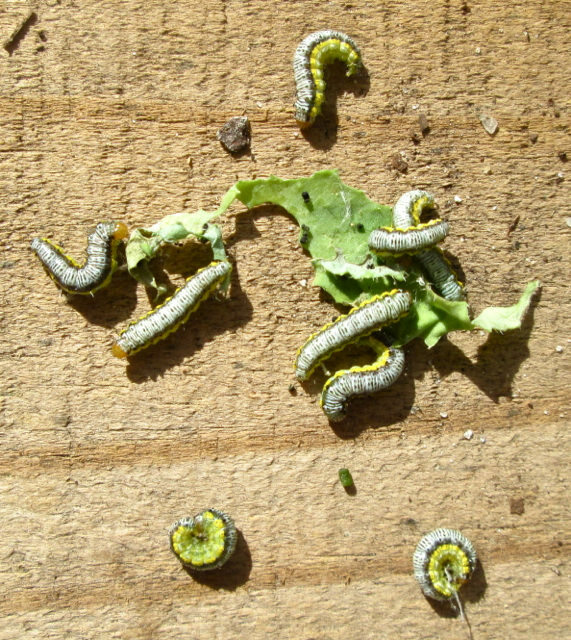 While sawfly larvae do a lot of damage, they are quite visible and don't disperse until they defoliate where they started. Now that you have identified what they are, like many agricultural pests, they can be knocked into a container of soapy water to halt the damage. On a small scale, that is a simple and very effective approach. Some sawfly larvae run around in a big wad to make themselves look larger than they really are. I don’t think dogwood sawfly is a pest of brassicas, at least I have never read that it is. I grow a lot of kale-luckily have avoided that voracious muncher. "When we kill off the natural enemies of a pest we inherit their work." Yep, that looks more like it. I can't believe how fast they did the damage. Like I said, I water those plants every day (they need to get in the ground!) and didn't notice the beginnings of munching. I have since cut off the damaged leaves, fertilized and brought them back inside under the lights until they recover.